Sometimes we used to monitor some websites continually for getting a specific information, like breaking news, online product availability checks etc: Here I am showing how can we capture a website information suing powershell. From the below example I am capturing information from one of the online newspaper and displaying as a popup notification, I used windows form to create the popup notification. Please follow the below script to capture some information from a website and display as a popup notification on your desktop. Capture the information from a website. Create a windows form to display the output. Schedule a task to run the script in a specific time\date. Right click on the page (The area which we are going to capture) and click on Inspect (I am using Chrome, it’s Inspect element in IE) to access the DevTool, we can easily identify the required HTML tag and class from DevTool. As per the above example, we are going to display the news headlines which is arranged using an HTML List tag (UL Tag) and its class name is “list8” – Based on the website design change, the HTML class name and tag may get changed. $WebsiteName = "Time of India"
ParsedHtml – It is basically taking in HTML code and extracting relevant information like the title of the page, paragraphs in the page, headings in the page, links, bold text etc. GetElementsByTagName – The getElementsByTagName() method returns a collection of all elements in the document with the specified tag name, as a NodeList object. Follow my below post about “How to build a form in PowerShell?” to understand more about the windows form. Basic Form creation cmdlet, I did some customization in our form. Below is the output display part of the form, you can customize based on your requirement. Part-3 Schedule a task to run the script in a specific time\date. Now we can run the below PowerShell command for scheduling our news update. Please note that the task scheduler command works only on the latest Powershell version, if you are using old PowerShell version, please import the module frPowerShellell gallery. $Action= New-ScheduledTaskAction -Execute "PowerShell.exe" -Argument "D:\Powershell Script\NewsScript.ps1"
Bellow is the another example of collecting HTML details from an online shopping website, we can create a script to get notifications for product availability - Please try to create the script. 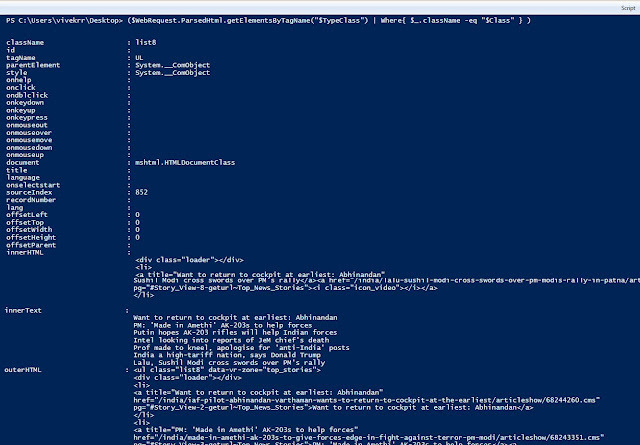 We are using com abject to interact with office application from PowerShell. Below are the com object for office application and we are using the word com abject to interact with word using PowerShell. I have highlighted the important properties in the object, please have a look. 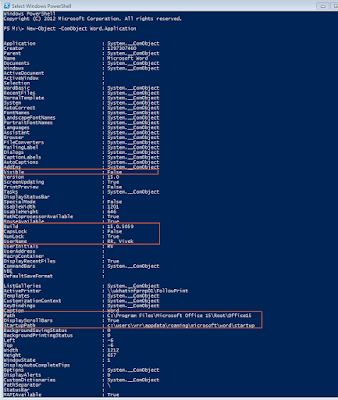 You can also check the process status using PowerShell as shown below. We need to enable the word visibility if you need to see the word document on the screen. I have highlighted the “Visible” property in the screenshot for your reference. To enable the visibility, follow the below cmdlet, this cmdlet is same for all the office applications. After the formatting, we can start adding the information into the word document. The information can be stored in a PowerShell variable after collecting from preferred sources, I am collecting a few system information using a WMI query and passing the information to a word document. Below is the information I am collecting for our word document. We need to save the document now, follow the below command to save the word document. 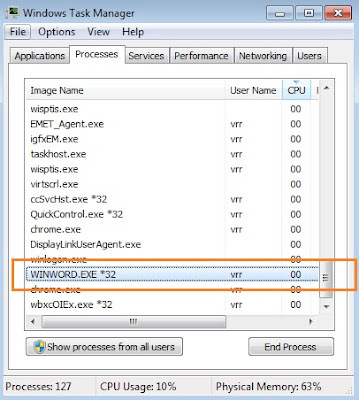 $WordPath = "D:\Temp\TestDocument.docx"
I just covered a very basic topic in this session for you to start using the PowerShell to create a word document, please explore more about adding content, formatting, editing etc. I am planning to post another session with more details on creating a word document using PowerShell.